FAIRFAX, VA—In the wake of last evening’s horrific shooting that killed 12 in a movie theater in Aurora, Colorado, representatives from the National Rifle Association asked all Americans to please try, in this moment of sadness and grief, to remember the myriad great and indispensable things that guns do for us every day. 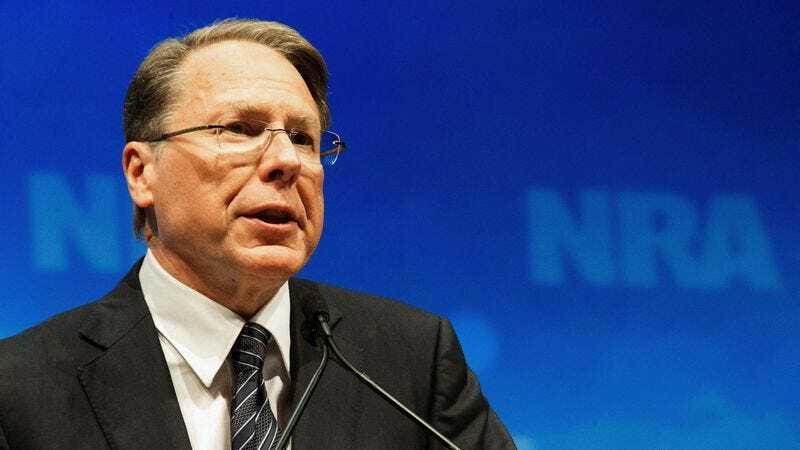 “While the events of last night are truly tragic, I sincerely hope that no one at any point forgets how truly terrific guns are, and how they enrich all of our lives on a regular basis,” said NRA executive vice president Wayne LaPierre, adding that the nation’s citizens must open up their hearts in this time of mourning and realize how simply unlivable a life without gun ownership would be. “From hunting, to protecting one’s home from prowlers, to target practice, why, there is practically no end to the ways in which guns are constantly improving our lives every moment of every day. As awful as this shooting was, none of us should ever forget that.” LaPierre then closed his remarks with a direct plea to the people of Aurora, asking them to try and imagine where they would be today without the citizen’s right to bear arms.